Team India is all set to clash against Bangladesh for the finals of the Asia Cup 2018. A while ago, the team left for the Dubai International Stadium and as they boarded the bus from the hotel, fans turned out in huge numbers to cheer the members of the team. 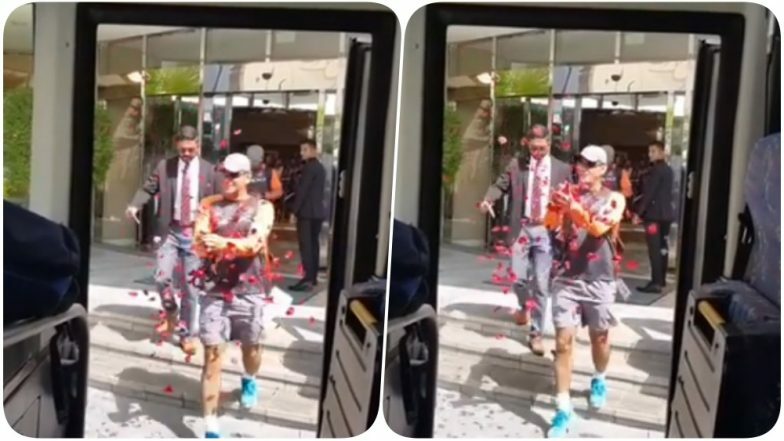 Indian fan Sudhir Gautam was also around as MS Dhoni walked out of the hotel, a fan somehow sneaked near MS Dhoni and showered a few rose petals on the former captain of India. Check out the preview for India vs Bangladesh, Asia Cup 2018 final. Talking about the finals of the Asia Cup, Shikhar Dhawan has warned his Indian team to not take the Bangladeshi players lightly because according to him it all depends on how the team plays on that particular day. Whereas Bangladeshi captain Mashrafe Mortaza said that the team will fight against India until the last ball. Team Bangladesh would miss the services of Shakib Al Hasan who has gone home owing to an injury. As of now, India has won the toss and elected to bowl first. Check out the live scores of the match here.